Green house facility covering an area of 450 square feet area is located on the VSMRF campus, with an automated temperature and humidity controlled system. It consists of the 30 benchs measuring the size of 6 ' X 1'. Growing zone is maintained at ± 2° C from the set points. Cooling within is provided by air suction through the water running between the cardboard pads covering the three fourth diameter of green house width. 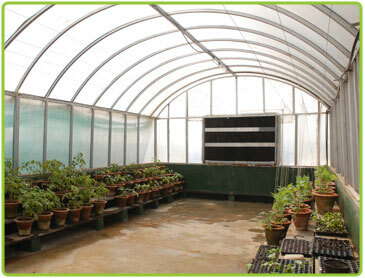 Green house facility is been used by the faculty and research students at the campus for basic and advanced studies.